I may have mentioned this before: Socks are comfort knitting for me. After my bad sweater experience, and with a cold coming on, I felt the need to cast on a new pair of socks. With a skein of Dream in Color Smooshy in colorway 43 Boot Camp, I started knitting Grapevine by Charlene Schurch. 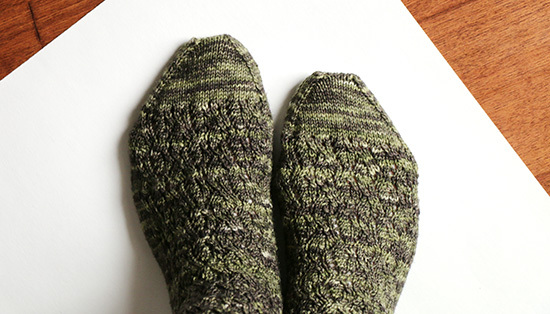 The pattern is from her book “More Sensational Knitted Socks,” and it knit up quickly on US-1.5 (2.5 mm) needles. The lace motif was probably a little more complicated than I needed while nursing a cold, but it would have been fine under normal circumstances. If I made any mistakes along the way, I haven’t noticed them yet! The fit is perfect. I’m off to drink more orange juice. What are your go-to comfort projects?